Our Journey To Addison Claire: STOMP! So, Donna and I were in the kitchen, and we heard AC shouting "RAAAWWWWRRRR! STOMP! STOMP! STOMP!" 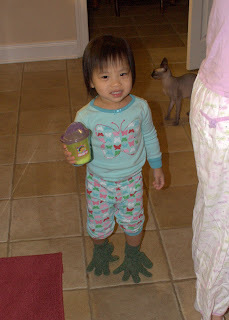 She came stomping into the kitchen wearing these on her feet. It was the absolutely funniest thing I have ever seen. We laughed until we cried. I only wish I had the video camera nearby to capture the stomping and the noise.